This is a quick note about a simple feature added to the searchable world tweet map visualization. 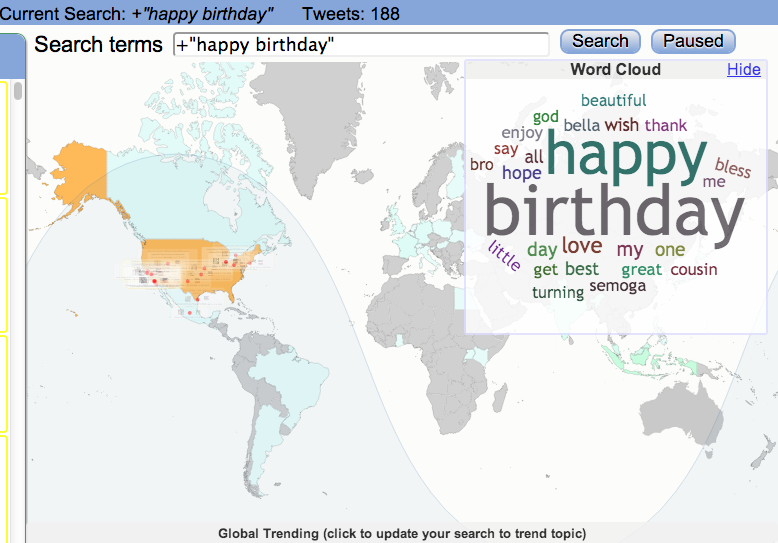 Namely, the wordcloud2.js project by TimDream was incorporated into this visualization, with the word cloud updated dynamically as tweets are received based on the search. When you're watching tweets streaming by, your eye can kind of pick out patterns, but the word cloud gives a somewhat better (and sometimes insightful) summarization. At this point, nothing fancy is done to handle a moving time window, bigrams, custom colors, etc. Nevertheless, right off the bat it seemed to add an interesting extra dimension to this visualization.